Home Entertainment Facebook Netizens News Social Media Trending Viral Photos Too Much Kopiko 78 Allegedly Endangered Woman's Life. 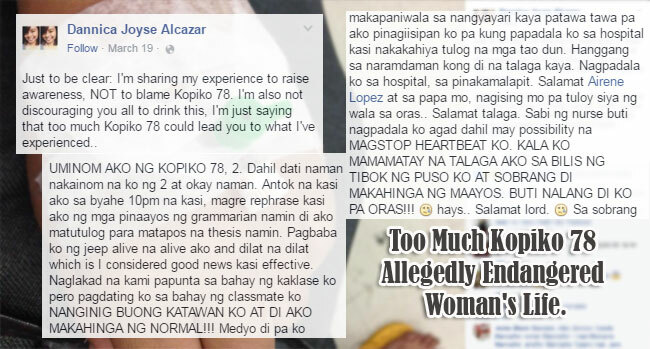 Too Much Kopiko 78 Allegedly Endangered Woman's Life. There is a viral post in facebook right now that was posted by user Dannica Joyse Alcazar last March 18. She wrote her experience drinking the coffee brand KOPIKO 78. According to her post, She drank 2 cups of Kopiko to overcome her sleepiness cause she needs to rephrase their thesis. When she got off the jeepney, she feels so energetic and she thought it’s because of the coffee but when she and her co-members went to their friend’s house, she trembled and can’t breathe normally. At first she was shocked on what happened to her but her friend offered her to bring to the nearest hospital. When they arrived, the nurse told her that she is very lucky that she was immediately rush to the hospital if not, she might die. Hearing this, she felt so nervous and she was injected enable for her to calm. Now, she is okay and advises everyone not to overdose drinking kopiko. Before posting her story, she reiterate that she is not blaming kopiko and not discouraging everyone not to drink it hence she said too much caffeine can lead to what she experienced. Her post trended in social media and as of this typing her post had 25,503 shares in just 2 days , was liked by 44,173 users and more than 12,000 comments. Her posts had various reactions from the netizens and a user name Rodnie Canes reacted that he also experienced it but with a different beverage while Yona Alazo warned her friends not to drink kopiko too much. Meanwhile Jonel Alvarez said that medicine is only a drug when abused and Alexandra Chan Revidad agreed with most of the comments that drinking too much coffee can really cause palpitation. Rj Fury on the other hand blames the coffee brand kopiko because he usually drinks 5 to 6 cups .